“Can you see him? My kitten? Oh, good! You can see him! When Ava meets an invisible cat in her garden one day she knows its the start of a beautiful friendship. Her and Squishy McFluff are off for some great adventures, with games and giggles along the way, join them as Ava’s family come to terms with their new invisible pet and Squishy McFluff and Ava get up to some mischief. This has to be one of the cutest books I’ve ever read. Aimed at the 4-7 age range it is a read-aloud rhyming book and works so well to grab your attention and make you laugh. I can imagine it would be perfect with a few kids and as I was reading it I wished it was around when I worked with little ones, and that I had my own little ones to read it to. The story is about the blossoming of a great friendship between Ava and her new imaginary friend. Anyone who has ever had an imaginary friend can probably remember them being their best friend, there’s no worries that they will run off and tell your secrets to other kids in the class and that they will tell on you if you do something naughty. I know I can remember that kind of thing from my very young days and so it made me reminisce a bit about being so young and able to do such fun things. Ava does naughty things and blames it on Squishy McFluff in the book and its quite sweet to see how the grown ups deal with this and what Ava’s reactions are. I loved the story for its simplicity and Im sure its going to be a great read for both child and adult alike. My favourite elements of the book had to be the illustrations and the rhyming though. I loved how well it all flowed and how much you got out of it even though it was restricted to the rhyme. Sometimes you’ll get twists in sentences in rhyming books just to make the lines match up and it can throw the rhythm off a bit but I didn’t get that with this book and I thought it was great. There were a couple of words I thought were a bit tediously linked but I’m sure they will be glossed over by most people as the book is so much fun. The art style of the illustrations is so lovely too and I liked that it was quite traditional. I know toddlers love their books to be bright and colourful but as this is a bit older the colours are toned down and the words take up more space so that the kids can read along too I think. When I mentioned this book on twitter a fellow blogger said her kids loved it but she thought it was quite long for a read-along book. I thought the same as I was reading it, its a good 70 pages and that kind of length aloud before bed could take a little while if you have kids like I did at kids club who liked to repeat the page after you read it to them. I thought that the use of chapters was great though and I think they are in there to break it up a little bit for those kinds of sessions. There are only 3 chapters but they work well to break the story down a little bit and possibly give the adult readers a good place to say ‘thats it for today, we’ll find out the rest tomorrow’ no matter how many sulks it will get! Basically Squishy McFluff was as cute as a button just as I thought it would be. Its the kind of book I’ll be recommending to every parent I know and a fair few non-parents too! I think it will work really well for the 4 plus age range especially in a place like my old work which was a kids club with a quiet reading corner, as it would give those who want to read the perfect story to read. I can’t wait to have kids and introduce them to Squishy McFluff! 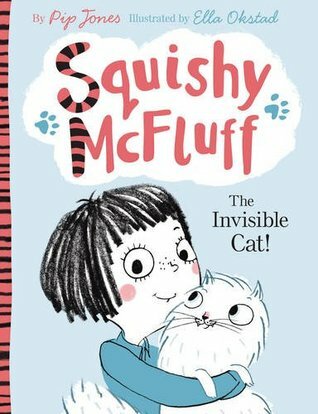 Squishy McFluff: The Invisible Cat was published on February 6th by Faber and Faber. My copy was sent to me from the publisher in exchange for an honest review.